I've made this three times - it's phenomenal. Scale back the chile, though, to half or less. This is a recipe from Spain, exact region is Galicia. Caldo Gallego is also known as Galician White Bean Soup. Particularly popular in Cuba more so than in Puerto Rico. A heavy Spanish influence is shown in this dish, as opposed to Cuba's national dish Ajiaco, which is heavily influenced by African slaves. Cuba's Afro Cuban roots evident both in cuisine and music. Ajiaco is a dish that features several root vegetables, among them malanga, yuca and boniato. 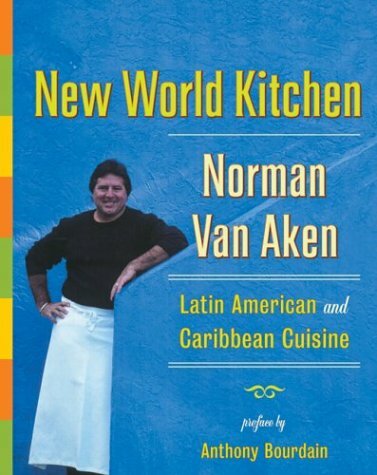 In this cookbook, Norman Van Aken explores the rich influence of Latin American cuisine on the American palate. From the African-infused Creole cuisines of Cuba, Puerto Rico, and Jamaica, to South American flavors from Brazil, Peru, and Argentina, to the distinct taste of Mexico--Van Aken works his magic on this luscious cornucopia and emerges with a wealth of brilliant recipes. Well-known in the culinary world for his passion and genius, Norman Van Aken has earned a reputation for innovation and artistry. Armed with his signature recipes, employing a cast of rich ingredients in inventive combinations, anyone can masterfully harness the fire and flare of Latin American cuisine.